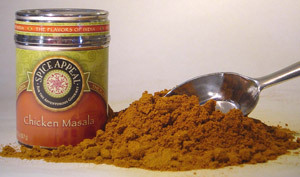 A flavorful mixture of Indian spices specially prepared for chicken curries. This mildly flavored, blend of spices creates the right balance of flavor and taste for a variety of chicken dishes. Creates a rich and hearty flavor when mixed with tomatoes and onions. Mix with 1 cup plain yogurt, lemon juice, garlic & ginger for marinating chicken. Spice mixture includes coriander, chili, black pepper, cumin, aniseeds, cloves, nutmeg, and other spices.